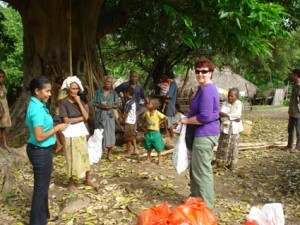 Coffee on the “road” … in Timor! We really aren’t kidding about our whole coffee thing! This time around Managing Director Carolyn Evans and Creative Consultant Roslyn Hull have been experiencing the roads all around Timor Leste – no longer the most recent member of the United Nations but still awaiting their 10th anniversary of membership. Discovering “cafe Timor”, the local brew, was a delightful experience, and also educational – not least in seeing a tourism training infrastructure make its beginnings from locales including fantastic practical training rooms created out of two shipping containers at the Dili Institute of Technology (also doing great things in the areas of motor mechanics trade training and civil engineering degree studies). Reprising the logic of our work in Peru in December 2010, nascent micro-business in urban, rural and remote settings was a key focus, along with assessing the actual progress in infrastructure and the next stage of community development needs that might be supported by government or other organisations – with a side order of arts via a concert by Ego Lemos, iconic Timorese musician and a visit to the truth and reconciliation museum.